Device development conducted at our institute can be transferred into a small-volume manufacturing process by ISO 9001 certified “π-Fab”. 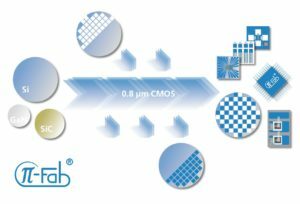 π-Fab is a joint collaboration between the Fraunhofer IISB and the Chair of Electron Devices dedicated to the realization of prototype devices under an industry-compatible fabrication environment. Fabrication ranges from single process steps across process modules up to full-fledged device fabrication including Statistical Process Control and Process Control Measurements on calibrated measurement tools. Additionally, electrical characterization for 100% device testing is available. These activities allow for the first phase of a product ramp-up when fabrication capacities by foundries – due to non-standard CMOS technology requirements – or the global players in power device fabrication are not yet available due to the low production values.